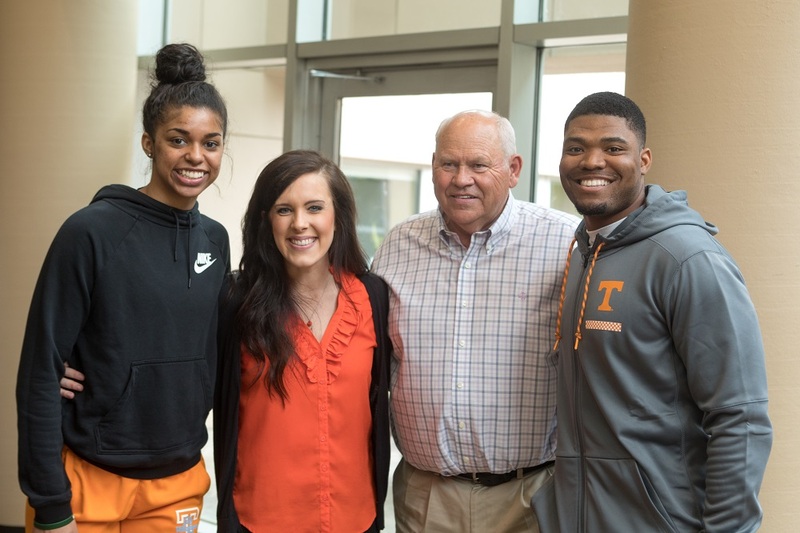 Pictured from left to right: Evina Westbrook, Rebecca Dotson, Phillip Fulmer, Todd Kelly Jr.
University of Tennessee Athletic Director Phillip Fulmer and student athletes Evina Westbrook and Todd Kelly Jr., recently partnered with 818 Ministries to make a special visit to Thompson Cancer Survival Center (TCSC) patients. “It means a lot to us to be able to meet patients and their family members. One of our four pillars in our athletic department is ‘warmth’ – our coaches and athletes care about each other and the community we live in,” said Coach Fulmer. Founded by Covenant Health employee Rebecca Dotson, 818 Ministries is a local nonprofit that delivers handmade hats and letters of encouragement to cancer patients. In addition to giving out hats and letters, Coach Fulmer and the student athletes signed autographs, posed for photos, and visited with patients and their family members. Their time was a bright spot in a long day of chemotherapy and radiation treatment for many patients. TCSC patient Olivia Russell holds a football autographed by Coach Phillip Fulmer. “Coach Fulmer and the athletes really took an interest in me. We had a good conversation about school and work. I told them it’s funny how things work out. I’ve received such great treatment here that I’m considering becoming an oncology nurse myself,” said Olivia Russell, a current Thompson patient and UT nursing student. Thompson Cancer Survival Center is a proud member of Covenant Health’s Thompson Cancer Network, which offers more imaging centers, more board certified physicians and surgeons, and more cancer and radiation centers than anyone else in our region. With access to the latest technology and most advanced treatment methods, we use a collaborative, multidisciplinary approach to guide patients through their cancer journey.